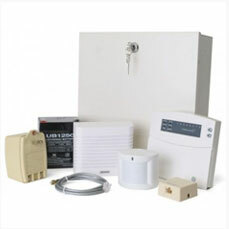 We offer Several choices in wireless alarms. from brands such as GE , ITI, Qolsys, and 2 Gig. From standard full alpha traditional Key pads, to talking systems and 7 inch touch screens. Wireless transmitters for doors and windows to tilt sensors for over head garage doors and even custom air conditioner anti theft sensors, smoke detectors and carbon monoxide, & glass break sensors. and key fobs. all lithium battery powered for years of use with supervision to let you know if and when any batteries need to be replaced, more on request, we can customize your system to your needs. Clean and accurate installation ,for any Home or Business , with capabilities of up to 100 or more sensors. We have been providing wired systems for many years both for existing structures and new construction. We install GE and United Technology Systems for good reliable user friendly equipment. That you can count on! 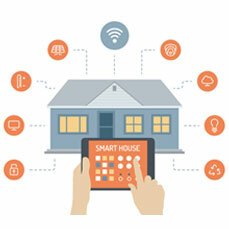 They can be connected to monitoring service if you like via phone land line or cellular GSM radio, you can even have the GSM service provide you with the ability to remotely control your system from your computer, tablet , I pad or I phone or smart phone, thru us if you so desire. if you are building a new house and would like it pre wired by us, we can do that for you, we have been working with many builders in the area for many years or if your house is already pre wired we can finish your Security System for you . and provide Monitoring Service if you like. Remote control of security systems. Thermostats for air conditioning and heating. Lighting controls , from simple lamps to wall switches. 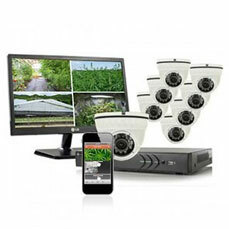 We offer excellent Video Security Systems and install them in private homes or business. We have been providing closed circuit camera systems for many years, and offer excellent equipment and installation of high resolution cameras for residential or commercial applications, from 1 to 32 cameras, no job too small! , from 2 megapixel to 5 megapixel cameras and standalone Network Video Recorders with 1 to 4 terabyte hard drives for recording, microphones also available for audio recording and even more if needed upon request. With your internet service we can provide FREE remote viewing via your computer , I pad, tablet ,I phone, or smart phone, with the free app provided, NO MONTHLY FEE, or complicated lease agreements! 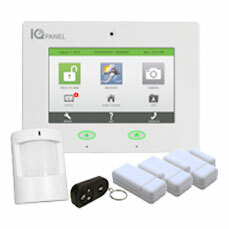 With video and a security system you can have a truly complete security system for your home or business.